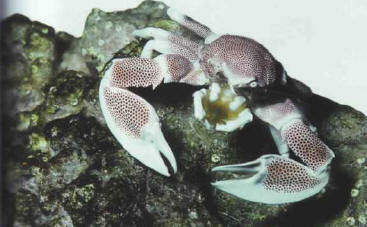 The crustaceans' bodies are protected by an articulated carapace. The animal abandons its carapace when it becomes too small due to body growth; this phenomenon is called the molt. The crustacean is particularly vulnerable to attacks from predators during the formation of the new carapace. The crustaceans found in aquariums belong to the decapod group, which have five pairs of walking legs, the first of which are used as pincers, with varying degrees of strength. The two pairs of antennae, highly developed in shrimps, play a tactile and sensory role. Crustaceans are carnivorous, and can feed on live or dead prey - they are not difficult to feed in an aquarium.